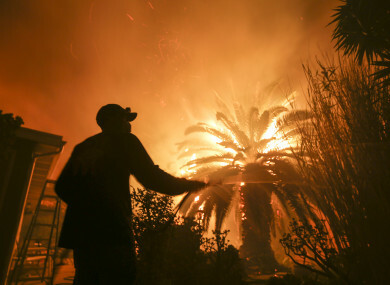 NINE PEOPLE WERE declared dead and tens of thousands evacuated their homes on Friday as fierce wildfires raged across the western US state of California, with one rapidly spreading blaze threatening the famed resort of Malibu. The fast moving blaze, known as the Camp Fire, began Thursday morning. Fanned by strong winds, it has scorched 70,000 acres and has not been contained, the California Fire Department (Cal Fire) said. In southern California, authorities said around 105,000 people had left their homes. Email “Nine die in California wildfires as tens of thousands forced to flee”. Feedback on “Nine die in California wildfires as tens of thousands forced to flee”.